Look at and listen to birds at the same time with this handy singing bird book and phone app. Birdsong on your Doorstep and your Mobile introduces us to our most common bird species and is the perfect choice for anyone interested in learning more about our flying friends. 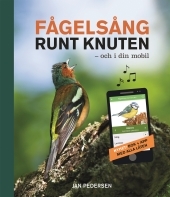 The book is full of fantastic photographs and illustrations together with brief descriptions of the birds’ songs, why they sing and what their songs mean and is accompanied by an app containing the songs and calls of all the species. Jan Pedersen also gives us interesting and expert insight into the lives of the birds and tells us where we can find them. The book even contains a unique birdsong key to help us to identify each bird’s melody. Birdsong on your Doorstep and your Mobile includes a free user-friendly app containing the songs and sounds as well as illustrations of every species. Jan Pedersen is one of Sweden’s most renowned wildlife and nature photographers and the writer and author of a long list of books that include Sweden’s Birds - a fieldbook for everyone, Bird Travelling and the highly successful Birdsong. The book’s wonderful illustrations are the work of the illustrator and landscape artist Jony Eriksson.